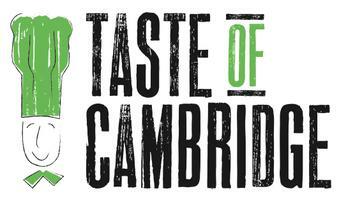 It’s been a couple years since I attended Taste of Cambridge, but it was a great event the last time I went. This year’s was supposed to be held last night, but has been postponed until next Tuesday, June 18, 2013 due to weather. All proceeds go to local charities. What to expect: Delicious food from local restaurants plus a beer and wine garden. Participants include 100 restaurants, from Upstairs on the Square to Lord Hobo, and local breweries like Pretty Things Beer & Ale Project. Tickets start at $50 ($75 for VIP access) and include samples (as many as you can eat), 4 drinks, and other freebies. More info here. 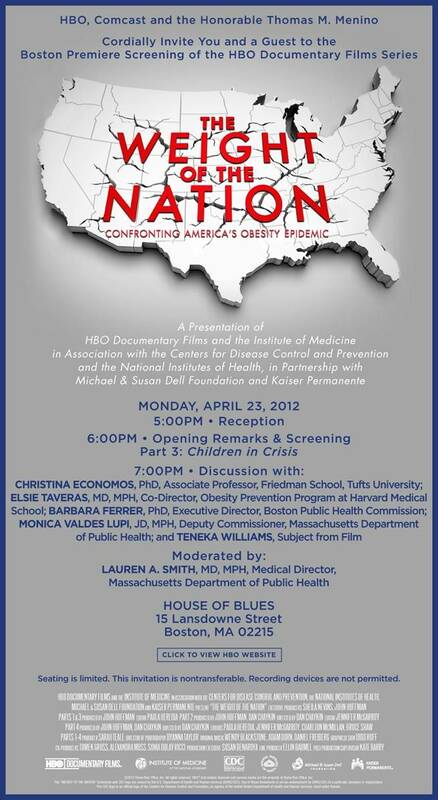 This coming Monday evening, HBO will be screening the new documentary The Weight of the Nation in Boston. Following the screening, Boston-area experts, including Tufts researcher Dr. Christina Economos, will speak on a panel about some of the issues raised in the documentary. If you’re unable to attend the screening, check the HBO website for showtimes. The centerpiece of THE WEIGHT OF THE NATION campaign is the four-part documentary series, each featuring case studies, interviews with our nation’s leading experts, and individuals and their families struggling with obesity. The first film, CONSEQUENCES, examines the scope of the obesity epidemic and explores the serious health consequences of being overweight or obese. The second, CHOICES, offers viewers the skinny on fat, revealing what science has shown about how to lose weight, maintain weight loss and prevent weight gain. The third, CHILDREN IN CRISIS, documents the damage obesity is doing to our nation’s children. Through individual stories, this film describes how the strong forces at work in our society are causing children to consume too many calories and expend too little energy; tackling subjects from school lunches to the decline of physical education, the demise of school recess and the marketing of unhealthy food to children. The fourth film, CHALLENGES, examines the major driving forces causing the obesity epidemic, including agriculture, economics, evolutionary biology, food marketing, racial and socioeconomic disparities, physical inactivity, American food culture, and the strong influence of the food and beverage industry. Marion Nestle, food policy expert, will be speaking at a forum called “Let’s Talk about the Farm Bill” at Boston’s Museum of Science in a couple weeks. This is part of the MOS “Let’s Talk About Food” lecture series. What’s the big deal about the farm bill? An interactive “teach-in” explores the ways that subsidies and regulations impact the quality and cost of the foods we consume here in New England. Learn about the process and meet some of the stakeholders, share your perspectives, and find out how the public can have a voice in reshaping the face of agriculture. Speakers include: Marion Nestle, PhD, professor of nutrition and public health at New York University, author of Food Politics and What to Eat; Representative Chellie Pingree (Maine), member of the House Committee on Agriculture; and Tim Griffin, PhD, Director, Agriculture, Food and Environment Program, Friedman School of Nutrition Science & Policy, Tufts University. Find out more details and register for the event here. What: The launch of Slumbrew, the experimental beer research arm (aka brewlab) of Somerville Brewing Company. Try their first three beers: Flagraiser IPA, Happy Sol, A Blood Orange Hef, and Porter Square Porter. Don’t have Halloween plans yet? Then check out the Cambridge Brewing Company’s annual Pumpkin Festival this Saturday! Sample 40 different pumpkin beers and pumpkin-inspired foods for the price of admission ($10, with a free pint glass). We had a great time last year! More information here. 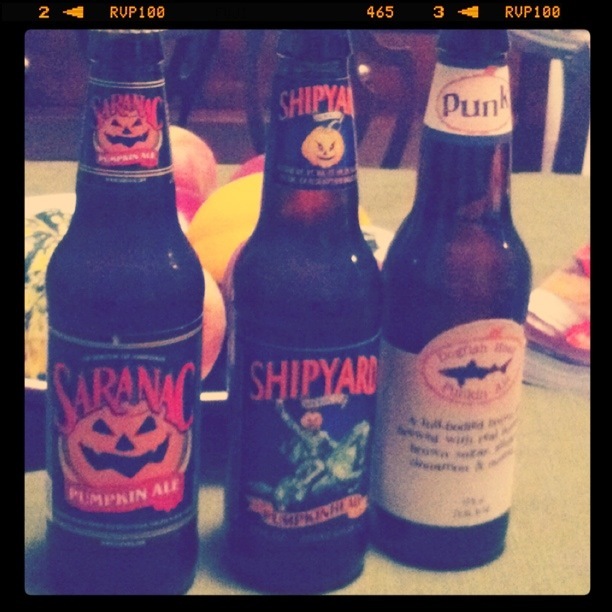 Saranac Pumpkin Ale – spicy! Cambridge Brewing Co. Great Pumpkin Ale – tastier than last year’s! Earlier this afternoon, I attended Mayor Thomas M. Menino’s speech for Food Day at Tufts Friedman School. In his speech, Mayor Menino encouraged the audience to “[work] together to make Boston the capital of good, healthy food.” He started off by displaying a number of visual aids he brought with him in a shopping cart – his CSA box full of vegetables from his own farm, an improved school lunch menu, an empty soda bottle, a Bounty Bucks voucher, a carton of locally produced ice cream (which he joked he wanted to take home with him), and a “reserved for food truck” street sign. Tomorrow, the city will be kicking off Boston Canned Share (their 25th anniversary) and Mayor Menino asked for support from the community to help needy families. The funds raised through this initiative go towards the Bounty Bucks program. He ended by taking some questions from the audience, but providing vague or tangential answers. Q. Brandy Brooks, from The Food Project – how is Boston working to strengthen the regional (New England) food system? A. He has encouraged other mayors to promote healthy living in communities but there are a number of challenges (e.g. budget cuts) to engaging them. Q. What types of things is the city doing with respect to increasing availability and space for kids to engage in physical activity? A. He mentioned that the Boston Center for Youth & Families hosts after-school programs and talked about the need to engage and reach out to kids who aren’t currently involved in physical obesity (like kids in public housing). He also called for the many groups working on childhood obesity to work together. Although I learned more about the nutrition- and food-related initiatives that Boston already has, I was a bit disappointed that Mayor Menino didn’t map out his vision for the future of Boston’s so-called “food revolution.” Instead, it felt like he was patting himself on the back by talking about all the things we already do. I’d like to know what new and innovative ways we’re trying to tackle childhood obesity, eliminate food deserts, and encourage nutrition education in homes, etc. moving forward! In Boston, the event will be hosted by none other than Tufts University (woo!). Mayor Menino will be on hand to speak about the importance of Food Day’s message, and his vision of the future of Boston’s food systems. The event is open to the public and registration is here. If you can’t attend in person, you can watch the webcast on the Friedman School website. Learn more about the event here and check out how other cities, communities, schools, organizations, etc. are celebrating.